Zakat Foundation of America’s (ZF) representative in Haiti says that people from all over the country are asking him about water filters. This is because in March, ZF launched a program to improve water quality for Haitian families that began with the distribution of 200 of what will insha’Allah be thousands of filters ZF distributes across the country. Access to safe water for drinking, farming, and bathing is a big problem for most Haitians, and it was this way even before the 2010 earthquake. Those who cannot afford to pay for water are forced to use polluted streams or rivers. • Purify up to 30 gallons of contaminated water per day. • Remove chemicals and disease causing bacteria using a patented clay and colloidal silver mixture. • Have clear instructions on the filter in Creole and info-graphs for people who cannot read. 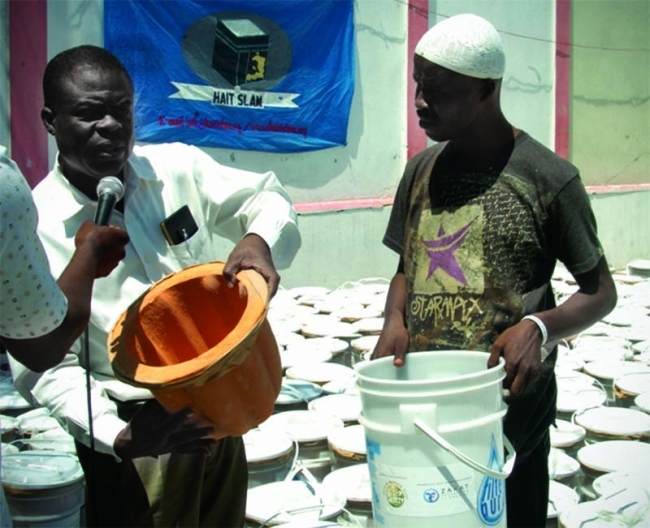 The March distribution of the water filters took place at a mosque in the Port au Prince area. Families from as far away as Cap Haitian travelled to receive them. Members of the local and national Haitian press were also present at the distribution and were encouraged by ZF’s work. ZF hopes to distribute thousands of water filters throughout Haiti to improve quality of life for Haitians and protect them from disease. Cholera is still present in the country and there is a fear that the number of infected people will increase substantially during the upcoming rainy season. Although the plight of the Haitian people has faded from the spotlight, ZF is committed to being a positive force in the country for the long term insha’Allah. There is no water ministry in Haiti to control of how water is managed in the country. Haiti has one of the world’s highest infant mortality rates, in large part because of dirty water. 47% of Haitians lack access to safe drinking water.